I lost a lot of sewing momentum after Christmas. I was sewing sewing knitting knitting knitting sewing so much that I needed a break. I’m starting to get back in the swing of things though and I finally have something to share with you today. 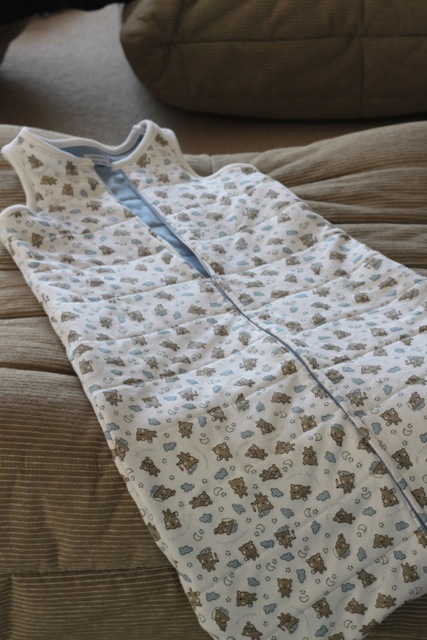 We bought little man a really warm and cozy sleep sack when we were in France last May/June. We were there during a cold spell and weren’t prepared. 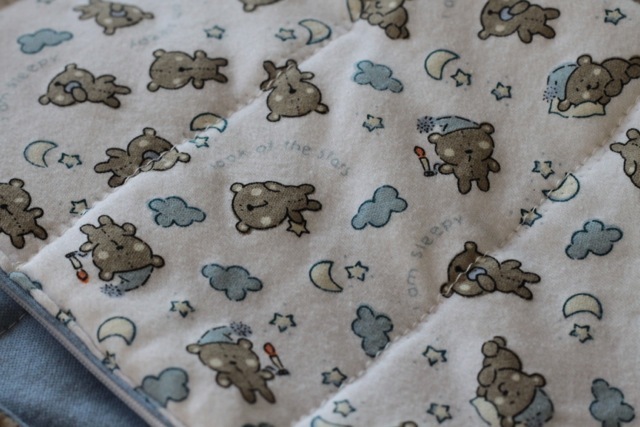 Luckily, just because it was June didn’t mean there were no warm sleep sacks available. The French have a thing about making sure their babies are warm. I mean REALLY warm. We’re talking bundled up in wool socks and a a heavy blanket while outside in 80 degree summer weather. It’s a bit over the top. But in this case, the sleep sack was well needed and appreciated. So much so that I decided he needed a second one, but these types of sleep sacks are no where to be found here. I’ve only been able to find fleece, which is fine, but less breathable than cotton with batting. 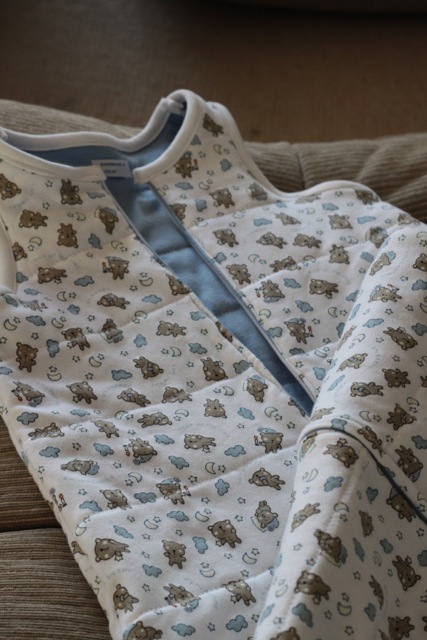 What I made is basically a quilted sleep sack. I used a stretchy main fabric, stretchy lining fabric, and cotton batting in the middle. For the neck and arm holes, I used strips of cotton ribbing that I folded into bias tape. The only difference between this sleep sack and the French one is that the zipper on mine opens downward and the French one opens upward. I tried to figure out how to do that, but I just didn’t have the right tools to make a zipper long enough for the sleep sack that opened upward. Oh well. I know sleep sacks have to be sold that way for safety reasons, but this is not being sold and I have deemed it safe enough for my level of comfort. I do still need to make a little fold that covers the zipper, but it’s pretty much ready. 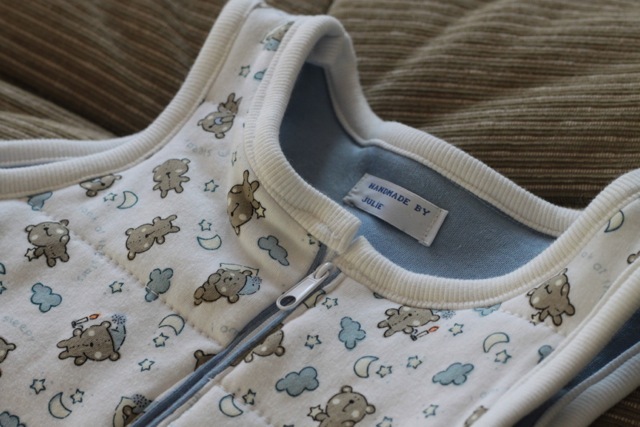 Also, notice the very cool personalized label on the sleep sack. My sweet husband got them for me for Christmas this year. Such a thoughtful gift for a maker of handmake things. Thank you honey! So there’s my latest creation. Hopefully I’ll get enough motivation together to work on some more projects to share with you soon. This entry was posted in DIY project, sewing on February 2, 2013 by seedsowingmama.